Standing alongside winners Jérémy Sauvageau, Simon Constantineau, Nicolas Fortin and Gabriel Samson, are organizers Sofia Pirro and Chris Lafleur-James. 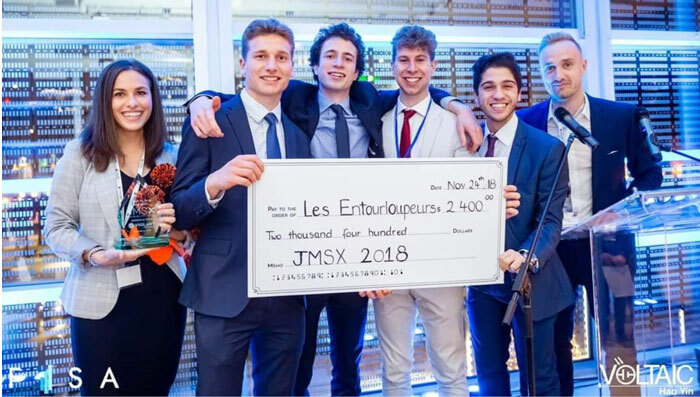 Four of the School’s Bachelor’s in Business Administration (BBA) students won the 2018 John Molson Stock Exchange competition, one of the largest open outcry stock simulation in North America. The competition was held on November 24, at the Montréal Science Centre. The team of Simon Constantineau, Nicolas Fortin, Gabriel Samson and Jérémy Sauvageau took home a cash prize of $2,400. This was the ninth edition of this outcry stock exchange simulation. Every year, about 200 students from the top universities in Canada, the United States and Europe take part. To win the competition, teams must maximize their portfolio with their investments and transactions throughout the day.